FAST EDDIE RACEWEAR | Canada's Best Apparel. Period. Saturday night saw the end of the rough streak that’s been dealt so far this season to the #3 Raybestos/Fast Eddie Racewear team. Hathaway managed to secure a spot on the podium this time around at Riverside International Speedway, laying down some amazing laps on the track. After qualifying in a career-high 3rd place, Hathaway and the team had set themselves up for success for the night. Wasting no time at all, Hathaway shot up to 2nd place right out of the gate, but then slid back into 3rd and stayed put, holding off cars behind him. Hathaway came in for fuel on lap 59 following a caution, but received a penalty for an incident on pit road and had to restart in 12th position. Hathaway took advantage of the green flag to pick up a few lost spots, reaching 7th by the time the caution passed. With the next caution, Hathaway’s team handed him an amazing 4 spots with their phenomenal speed, and he rolled off pit road in 3rd place once again. On lap 242, Hathaway made a break for first, and managed to pull it off. He led the way for 47 laps, right up to the end of the race, but unfortunately a lapped car bounced him around with just 10 laps to go, and Hathway was squeezed out of the lead and wound up 3rd on the checkered flag. “It is awesome to finally be back up here on the podium. We have had a tough season so far and it was great to get out in front and run competitively. The boys did an awesome job on the tire stop and that helped us huge.We really wanted to win tonight for our little boy who had to stay home sick tonight, but really this finish is like a win for us tonight. I have to thank our owner and all of our sponsors for sticking with us over the last little bit,” said a satisfied Hathaway after the race. You can catch all the Pinty’s Series racing action all summer long on TSN; be sure to cheer Jason on! Here’s the full race schedule for the 2016 season. Check out Jason’s full Pinty Series stats here and check out his NASCAR Home Tracks video here. Let’s start this post by welcoming everyone to the 21st century… a magical time when millenials take to the internet when anything happens, ever. Whether it’s ranting and venting, or celebrating and congratulating, the internet is a never ending stream of self-expression. 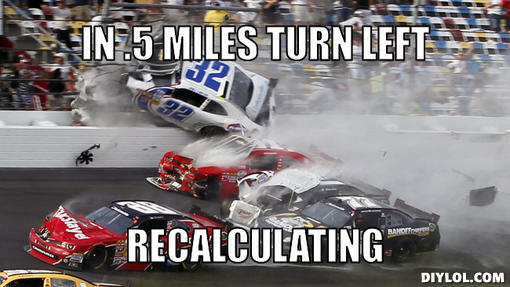 Our beloved NASCAR fans are no exception. 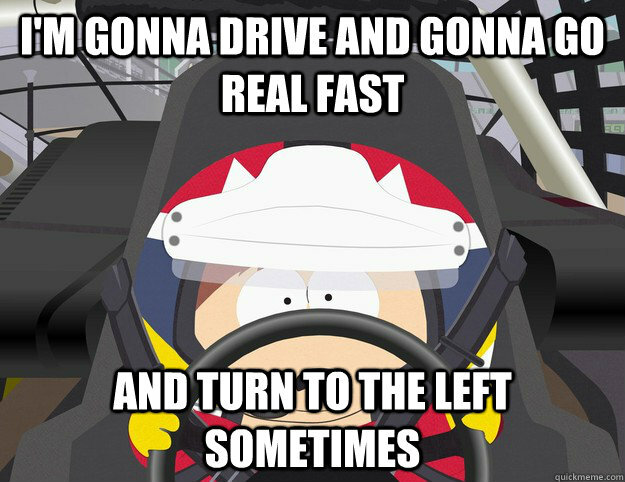 To that end, let’s take a look at some of the best NASCAR memes out there. #5. 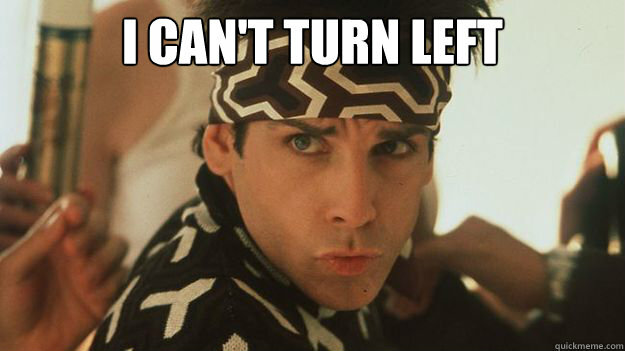 We feel ya, Zoolander… we’re not “ambi-turners” here either. #4. Patience isn’t a virtue when it comes to NASCAR… in the off-season, it’s torture. #1. 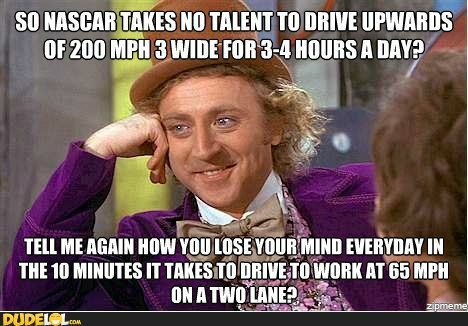 Ever wonder how NASCAR drivers got started? The #3 Raybestos/Fast Eddie Racewear team were feeling pretty optimistic heading into the Wednesday night race at Wyant Group Raceway. Hoping to turn around the streak of bad luck they’ve been dealt all season, the team made sure the car was in peak condition during practice, and managed to qualify 8th for the starting lineup. As a 250 lap race, there was plenty of space for Hathaway to make his way up to the front of the pack, and he did exactly that. The car was in great condition and lent itself well to Hathaway as he weaved in and out of the cars ahead of him. By lap 92, he was leading the group. Hathaway maintained tight control for nearly 50 laps, and then dropped back to second place. Having led a good chunk of the race, it was brutal timing when Hathaway ran into some trouble with the back end of his car. With just 33 laps to go, he was pulled onto pit road with a broken axle, and his night was over. Coming so close to such a great finish was of course a frustrating end to the night for the team, especially considering the rough season they’ve been having. “We had a car here that we could have won with tonight. We have had a wicked string of bad luck this season and I hate it for this team and our sponsors. The boys worked hard to get this car right after the accident in Edmonton and we had a great thing going tonight,” said Hathaway following the race. The team has a couple of weeks to shake off the disappointment of tonight’s race before hitting the Grand Prix de Trois-Rivieres. You can catch all the Pinty’s Series racing action all summer long on TSN; be sure to cheer Jason on! Here’s the full race schedule for the 2016 season. Check out Jason’s full Pinty Series stats here and check out his NASCAR Home Tracks video here. The fifth race of the 2016 NASCAR Pinty’s Series circuit came to Toronto on July 16th. A temporary track is set up annually through the streets of the city to host the Honda Indy. So far this season Hathaway has had a few disappointments and coming into the Indy Hathaway was really looking to make up some ground in the points standings. Starting out in 10th place, Hathaway made quick work of moving up the ranks. Making steady progress on each and every lap, he was sitting comfortably in the 5th position by the midpoint of the race. When he attempted to pull past the 4th car, he spun out in the corner, and lost a number of spots. Being about half way through the 35-lap race already, and with a caution cropping up int he final laps, Hathaway struggled to regain the lost ground. Nonetheless, he made it back up to finish 11th in the final standings. After the hard work that went into first half of the season, with little reward, the team was looking forward to the western leg of the circuit. They hit Wetaskiwin Speedway on Saturday July 23rd, hoping for some redemption and to make up some points on the leader boards. Unfortunately a brutal hit from another car sent Hathaway into the wall, and he was sidelined on lap 103. The team was understandably disappointed with the result of the race, but with another race coming up at Wyant Group Raceway on the 27th, they’re hoping to dig their way out of the slump they’ve been in so far this season. You can catch all the Pinty’s Series racing action all summer long on TSN; be sure to cheer Jason on! Here’s the full race schedule for the 2016 season.Check out Jason’s full Pinty Series stats here and check out his NASCAR Home Tracks video here. Hathaway and the Raybestos/Fast Eddie Racewear team were in Mirabel, Quebec over the Canada Day weekend for the second road course of the 2016 NASCAR Pinty’s Series. Hathaway qualified for an 11th place start placement at the 30 lap Circuit ICAR event, and his outlook was good at the onset of the race. Hathaway quickly jumped to 10th place, wasting no time on the very first lap. But the team’s luck quickly came to a halt; on lap 4 the car encountered some trouble, Hathaway coming in to pit road on reports of a broken axle. The team worked quickly to get the car back on the track, but unfortunately, there weren’t enough opportunities to regain lost laps in the remainder of the race. Despite a great run, and maintaining the 6th position for most of the race, Hathaway simply couldn’t make up the lost laps. In a post-race interview, Hathaway explained that the Circuit ICAR track does not traditionally see a lot of cautions, and that was what vetoed a solid finish for him here this weekend. The team is looking forward to the Honda Indy in Toronto and hopes to break the streak of bad luck they’ve had so far this season. You can catch all the Pinty’s Series racing action all summer long on TSN; be sure to cheer Jason on! Here’s the full race schedule for the 2016 season.Check out Jason’s full Pinty Series stats here and check out his NASCAR Home Tracks video here. Jason Hathaway and Team 3 Red have had a rough go of it so far this season; although their performance has been stellar, influences beyond their control have dealt them setback after setback. The season opener was disappointing for the team, where, after leading for most of the race, Jason finished 9th after a spin-out caused by another driver with just two laps to go. Optimism was high when Hathaway headed to the Autodrome Chaudiere on June 24th, as he was going in as the defending 2-time winner at the track. Starting 13th, Hathaway made it made it to 6th within just 10 laps. He rocketed up to 4th in the second half of the race, but within the final laps Hathaway slid back to 7th as the track cooled and handling on the #3 car tightened up. Heading into the 4th race of the season this weekend at Circuit ICAR, the team is really looking for some points to try to remain in contention for the season championship. You can catch all the Pinty’s Series racing action all summer long on TSN; be sure to cheer Jason on! Here’s the full race schedule for the 2016 season.Check out Jason’s full Pinty Series stats here and check out his NASCAR Home Tracks video here.